"I can not describe how amazing you have been, with the headpiece and the veil. 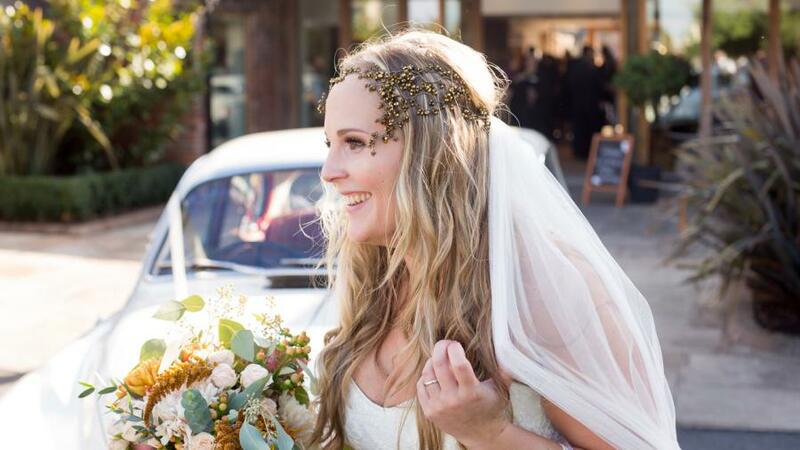 I can not imagine my day without it, so many people were fascinated by the headpiece, it really did complete my autumnal theme, - and to top it off the sun was glorious after the church, so we really got to see the headpiece in full twinkling mode with the sunshine!!!! So thank you to the moon and back!" We could not feel happier to receive Rochelle's amazingly kind words. We are delighted to have been a part of her wedding day and made her so happy! Thank YOU Rochelle! Rochelle chose to wear a bespoke version of our Nadine Crystal Nova Gold Headdress. Wedding photography by the talented Enchanted Wood Photography.